This is Albert he..s 2 years old and i have owned him for just over a year. He is tame and talks a lot.loves lots of attention. I..m only selling as a change in circumstances means i cant give him the attention he needs and requires. Will come with 2 cages and a large java tree plus food and a few toys. 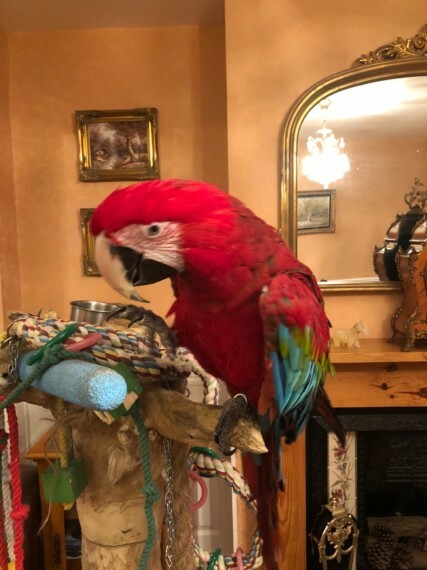 He didn..t come with any paperwork when I bought him and after contacting The Parrot Society UK they informed me he doesn..t need any all his information is on his leg ring he may have had a hatch certificate but that..s up to the breeder to issue if they choose I will consider any reasonable offer.